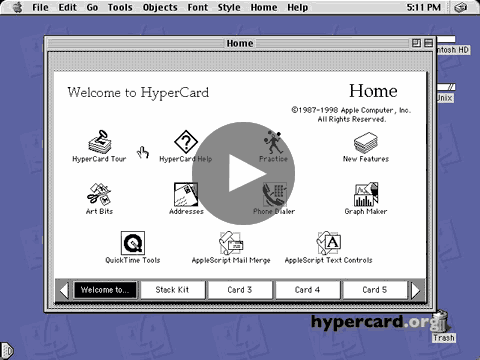 HyperCard | The software erector set. CompileIt! Manual - This is a PDF of the manual to CompileIt!, a HyperCard stack that allows you to write HyperCard command plug-ins that access the Mac's system API and let you do everything any Mac programmer could do. HyperTalk Reference - This is a PDF containing screen shots of most of the pages of the HyperTalk Reference stack that came with HyperCard 2.4. MediaTalk Reference - This is an HTML-dump of the MediaTalk documentation included with Oracle Media Objects. The xTalk Interviews - Short FAQ-style interviews with various people from the history of HyperCard and its clones. Pantechnicon - Lots of HyperCard stacks. These are the files that used to be hosted at the HyperCard Pantechnicon. OpenXION - A cross-platform HyperTalk-like programming language written in Java, with source code. HCX - Mac OS X source code for reading HyperCard stacks. stackimport - A command-line tool that exports HyperCard stacks into image files and XML suitable for import into other applications. CinsImp - A HyperCard clone that runs on the web. This is a port of a previous Mac desktop application of the same name, for which Source code is available. HyperCardPreview - An application written in Swift that tries to faithfully render HyperCard stacks on OS X, bitmap fonts and all. Stacksmith - An open source HyperCard clone-in-development of which you can already try occasional builds. HyperCard File Format - A description of the general structure of a HyperCard stack on disk. Pierre's HyperCard File Format - A modified version of the HyperCard File Format description above that contains additional information. Contributed by Pierre Lorenzi. AddColor Resource Format - A description of the general structure of the resources used by HyperCard 2.3 and later to store color information. ColdCoffee HyperTalk to Java converter - A bunch of Java source code files that read a subset of HyperTalk and create Java source code from that. XFromApp XCMD engine - Old C/C++ source code for running HyperCard plugins (XCMDs and XFCNs). Mostly of historical interest. HyperTalk 1.x BNF grammar - A grammar for the HyperTalk programming langiage. SuperCard - The first HyperCard clone. For Mac OS X.
LiveCode - Originally known as MetaCard, this cross-platform IDE runs on Windows, Mac OS X, Linux, Android, iOS and as a browser plugin. BayCard - A modern HyperCard-like system for the Mac with Button Tasks/ClickScript-style programming.